It’s October, And The Stock Market Has Not Given Up Yet! The stock market has continued to edge higher, supported by an ongoing accommodative monetary policy, a steady economy, and prospects for an improving earnings picture. This market outlook is not expected to change at least for October and early November. Presidential election expectations priced into the stock market appear to be holding, although there is still a month left. Consequently, elections and monetary policy will take a backseat for the next two weeks as the focus shifts towards the earnings season, which begins in full swing from next week. The stock market held its ground during the third quarter, inspite of enhanced volatility during September. The Federal Reserve’s decision to refrain from a rate increase in September, allowed the stock indexes to consolidate near all-time highs. 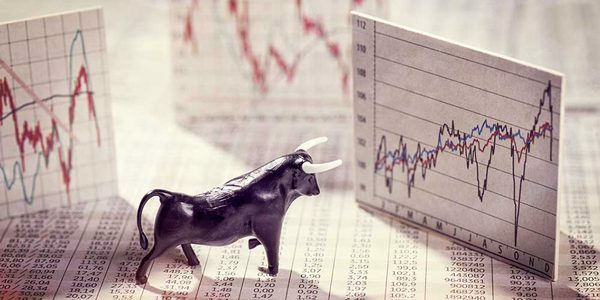 There has been growing skepticism for many months about the health of the stock market, with earnings recession, presidential elections, oil meltdown, and looming recession, being a few of the reasons often cited for the correction. Third quarter saw the stock market overcome this wall of worry as key indexes climbed higher. The Nasdaq (QQQ) surged +10% during the quarter, on a rally driven by technology and healthcare stocks, while the S&P 500 (SPY) was up +3%, and the small-cap focused Russell 2000 (IWM) gaining +9%. For the year, the Nasdaq is up +6% and the S&P 500 +6%. The stock market momentum was also reflected in our model portfolios, with the Graycell Smallcap up +65% compared to benchmark Russell 2000 up +10%, and the Prudent Biotech portfolio up +13%, compared to its biotech benchmark IBB down -14% for the year. Where the stock market goes during the fourth quarter is largely earnings-dependent. The S&P 500, which has had 6 quarters of negative earnings growth, will once again have a declining growth quarter, in what is being frequently referred to as a profit recession. However, the shallow nature of the profit recession must be noted. Third quarter earnings for S&P 500 are expected to decline less than -1% from a year ago. We're not encountering an earnings free fall, as is symptomatic of an economic recession. Consequently, it's the shallowness of the earnings recession which underpins the investor expectation of an improving earning outlook for the fourth quarter of 2016, and the year 2017. This viewpoint is being reflected in the P/E ratio of S&P 500 of 25 times reported profit, higher than the historical average P/E of 17. Interestingly, the forward P/E ratio for S&P 500 for four quarters is 17, as per Thomson Reuters. Thus, the S&P 500 valuation is not as much out-of-sync as may appear at first glance. The expectation is for Earnings to catch-up; and it's not a pie-in-the-sky expectation. The Energy sector, which accounts for a 7% weight in the S&P 500 index, has precipitated the earnings recession for S&P 500 this year. But for this sector, S&P 500 earnings would have registered positive growth already. Energy will account for bulk of the S&P 500 earnings decline for the third quarter, with sector earnings declining 66%, following a decline of 85% during the second quarter, as per Thomson Reuters. The improvement in oil prices, if maintained, can assist the energy sector earnings as early as the fourth quarter this year. Technology sector is experiencing a strong earnings rebound that boosted the Nasdaq index to record highs in the third quarter. Technology is witnessing broad-based rising earnings estimates across many of its sub-groups including semiconductors, internet, storage, and hardware. With the weight of technology stocks at a high 44% in Nasdaq index, and an equally important 24% weight in the S&P 500, the sector can have a profound impact on the key indexes. We believe that technology stock earnings should provide strong support to market valuations as the earnings season unfolds. The technology earnings report will pick up momentum from next week onwards. Some of the major technology stock names whose performance can contribute towards shaping the direction of the market, include Amazon (AMZN), Netflix (NFLX), Alphabet (GOOG) (GOOGL), Facebook (FB), Intel (INTC), Microsoft (MSFT), Netapp (NTAP), Adobe (ADBE), Sap (SAP), Momo (MOMO), Weibo (WB), Netease (NTES), Alibaba (BABA), and Sina (SINA). Healthcare is also an important group that has shown recent price momentum. The negative report by Illumina (ILMN) earlier in the week has created pressure on the sector, which should be alleviated as the earnings season progresses and some key pharmaceutical and biotechnology companies report, including Pfizer (PFE), Merck (MRK), Johnson & Johnson (JNJ), Abbott Labs (ABT), Gilead (GILD), Amgen (AMGN), Biogen (BIIB), Incyte (INCY), and Seattle Genetics (SGEN) amongst others. Data released over the past month points to an economy that is steady. Key economic indicators are showing beginning to show sufficient improvement to bolster a case for an interest rate increase in December 2016. GDP Growth was revised upwards to 1.4% annualized growth from 1.1%. Non farm Payroll for September was reported at 157,000. The number was below the consensus estimate of 175,000, but still at a level suggested steady growth in employment. The Purchasing Manager's Index ((PMI)) bounced to 51.5 in September, notably above the key 50 level which suggests manufacturing expansion, and was well above market expectations of 50.3. 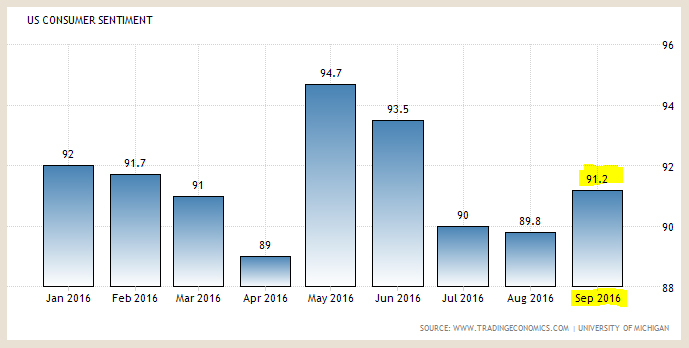 The consumer sentiment indicator recorded a 3-month high as it climbed to 91.2 in September, ahead of market expectations of 90. However, consumer spending was flat in August from July 2016, after being up strong over the prior four months. Hopefully, the September number would show some growth, since consumer spending does account for a significant portion of economic activity. Major stock market corrections typically occur due to prospects of an economic recession or a systemic shock. The economic data doesn't suggest that a recession is on the horizon. The potential for a systemic shock is low but still exists with the US presidential elections a month away, the geopolitical issue of Russia and Syria, and system-driven flash crashes which create huge imbalances in orders in a very short period of time, amongst other issues. As the stock market pivots towards earnings, it can be a volatile period with the market adjusting to the early reports and extrapolating it to the entire universe of reporting companies. We anticipate earnings to be generally in-line with consensus, and preserving the key market expectation of an improving earnings outlook. This expectation is a critical construct for supporting valuations, and it's important to be watchful for any meaningful deviation, which can create sharp downside volatility and a change in our stock investing strategy. We believe the upside bias in stocks continues at this point, and we will remain invested in October and perhaps into November, based on earnings and political outcomes. We presently believe that late-November and December has the potential to be negatively influenced by the looming interest rate decision of the Federal Reserve. This is our current stock market viewpoint and is subject to change. Our quantitative stock portfolios are directed by input from the models, which may eventually disagree with our current opinion. As always, kindly do your own due diligence. The article was also published on Seeking Alpha.